Phillip Hammack won the Louise Kidder Early Career Award from the Society for the Psychological Study of Social Issues. 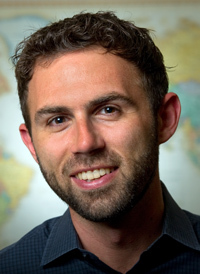 Phillip Hammack, an assistant professor of psychology at UC Santa Cruz, has been awarded the Louise Kidder Early Career Award from the Society for the Psychological Study of Social Issues (SPSSI), a division of the American Psychological Association. The award recognizes researchers who have made substantial contributions to the field early in their careers. Hammack joined UCSC in 2007 and is the author of Narrative and the Politics of Identity: The Cultural Psychology of Israeli and Palestinian Youth (Oxford University Press, 2011). Earlier this year he was named a 2011-2012 National Academy of Education/Spencer Postdoctoral Fellow. "Phil Hammack does cutting edge work on how identity and culture are navigated through narratives," said UCSC psychology department chair Avril Thorne. "Although a relative newcomer to social psychology, his work has already provided a critical context and direction for understanding the development of sexual and cultural identities. In my view, his receiving this award is a no-brainer." During the 2010-2011 academic year, Hammack was a visiting fellow at the Joan B. Kroc Institute for International Peace Studies at the University of Notre Dame. According to the citation from the SPSSI: "Hammack systematically studies social issues with scientific rigor and sophisticated understanding of social contexts, culture and the construction identity with a specific attention to the relevance of his research for social policy. His research findings are groundbreaking, making an impact on number of disciplines." The award is given to nominees who have made substantial contributions to social issues research within five years of receiving a graduate degree and who have demonstrated the potential to continue such contributions.